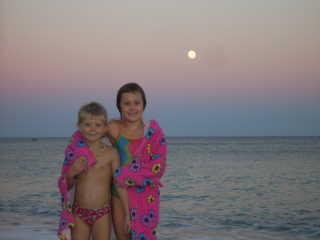 Just after a swim in the Med - by moonlight! 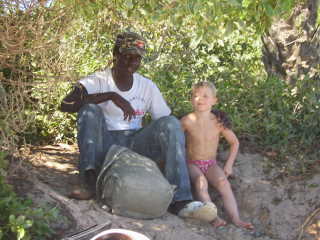 Ben has a chat on the beach! 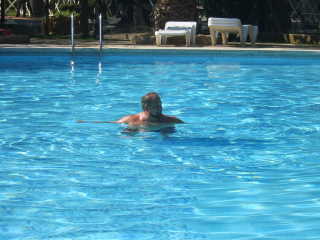 A swimming pool - all to myself! 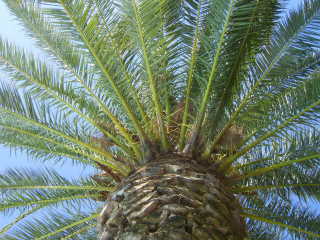 One of the views from our pool side sun bed! Southern Spain -the rain on the plains!? The extra new safety device arrived at the campsite and our willing Dutch neighbours helped Phil to adapt to it straight away! Phil being Phil – out came his collection of tools! And so – after nights where we have slept under the stars just outside Nessie – we moved on and left some of that wet stuff behind(that we are not used to any- more! 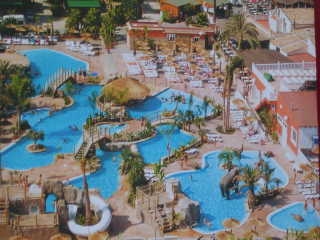 ).....and began to make a beeline track from Alicante towards Lisbon. We have had long stints at the last two camp sites and have thoroughly enjoyed this time – but now it was also excellent to be back out there on the open road! We managed to get to an appealing campsite in the forest which was extremely peaceful and quiet (before we arrived! )- as the site closes for the winter season soon. 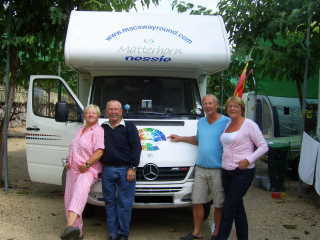 Camping Rio Mundo is situated at Mesones, in the Sierra de Alcaraz and is typically Spanish. It is recommended for those wishing to explore the countryside and experience true rural Spain. It was made ever more exciting as very little English was spoken! We made tracks and arrived to the south west of Madrid at Camping El Greco at Toledo. We had panoramic views of the ancient city which we took a look around. Our friendly Scottish neighbours (Jamie & Jen) offered us a lift in their ever faithful Land-Rover to the city and back – which was very kind and saved us waiting for an unknown bus on a Sunday! We enjoyed some time with Jamie and Jen and the children were entertained by their 1 year old - smiley daughter – Caitlin! 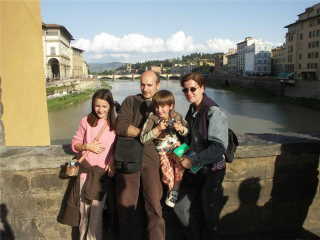 They were interested in our trip and were themselves exceptionally well travelled. We heeded lots of advice to take with us in our travels and we may even meet again as we make our way to the Highlands again, in later times following this trip! We would like to update everyone on the Nessie break in and tell the story that restores our faith in mankind -to see that there are still descent people left in this world! After a scare like we had -it does make you extra suspicious of everyone and extremely un-trusting! 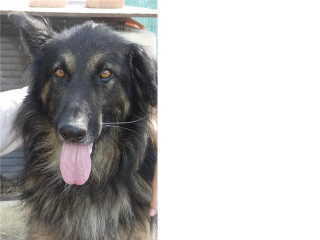 However – we have been contacted by email by a French family who happened to be walking their dog – Banjo! in the Montpellier area and it was Banjo who actually sniffed out Jemma’s bag! As there were no young children around or GB vehicles – the family decided to take the bag home and try to track down its owner. Jemma had her secret diary with our names and website inside and a search on the internet led them to our Devon Air Ambulance press release! They were then able to find our website, read the blogs and discover what had happened to us all! We NEVER expected this and we would like to personally THANK Fabrice, Anne, their children Maureen and Loic and their dog Banjo for taking the time to track us down! After a series of emails – they have actually posted the belongings back to us in Spain too! Jemma has her bag , bits and bobs and secret diary back and her purse! Ben has his wallet back too – including the coin collection that he has been so enthusiastically collecting as we have travelled our countries so far! And finally – and even more unbelievably so- Phil has his wallet and driving licence back too! No cash or cards included – as to be expected! A bit of a happy ending though! Spain and the Sea Food Platter! We picked up sticks and moved to Spain. Within the day we had found a Mercedes garage and Phil got some parts and mended Nessie. We went to the Costa Brava - to a campsite named Nautic Almata which was perfect for water- sport enthusiasts – especially when wind was on the menu!! Again – warm, sunny and breezy was the order of the day.......we took a beach- side pitch and the children were in their element swimming in the Med again – from another side! This campsite closed for the season on Sunday 14th September and we were found out that the Spanish schools returned back on the 15th September after a very long summer vacation. Jemma and I had our hair cut (Jemma’s for the 3rd time this adventure) and mine cut short because I find it too hot for long hair!! 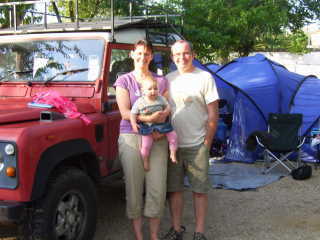 So-as this campsite was closing - we had to move again –we would have stayed longer if we could! We found a campsite which we have visited and enjoyed in our previous travels –in the Costa Daurada near Tarragona – La Costa Del Sol. It was ironic that we have travelled this distance and our receptionist was from Bideford -15 miles from our home in North Devon! It is a small world after all!! We had an enjoyable and eventful day down at the beach – some 70 metres from our pitch! We were hounded by the “Lookie Lookie Men“and within the space of 10 minutes Phil was offered a watch, a shirt, sunglasses and a Tia massage!! Phil continues to blame my white legs for the “Lookie Lookie Men” – as they seem to be some sort of magnet?! Jemma made a hasty exit from the sea after being stung by ‘something’ and on closer inspection the stings were all in a line – indicating a Jellyfish sting. Out came the bag of remedies kindly given to us by our neighbour – Lin (a qualified Medical Herbalist) – before we left- and we have to say that the bite lotions and potions have been used often! !Thank-you very much!! We also enjoyed a lovely time in the swimming pool here-lots of new extensions to the swimming pool area – including a Jacuzzi from 4 years prior! Time to move through Spain again – but we were able to give Nessie her first well deserved bath before we left La Torre Del Sol. We drove not far off 300 miles that day to get to a campsite near Alicante – on the Costa Blanca – Camping Internacional La Marina. In our opinion this campsite has one of the best swimming pool complexes with Jacuzzi and sport and fitness facilities ......... even with a pool- side bar! There is also mega good 24 hour security too – which is very important to us at this time – as I’m sure you can imagine. We are waiting here for the post as we have ordered another new extra security device- online. This is in our mission to make “Macswayround” even safer and to save the wear and tear on Phil’s Hardwood baseball bat. There have been creative activities here- which the children have thoroughly enjoyed (as there is limited space in Nessie) and Phil does not appreciate Glitter and glue everywhere–but they have certainly had their fix here! There have also been weekend evening entertainments for the children and Jemma even went along sporting her new traditional Spanish dress! We have even had time for monopoly –and you know how many hours that can go on! Our children are very keen on making money for their next travel adventures and Ben has even started writing plans for his travel route when he goes round the world- when he’s a grown up! He is trying to raise some funds for this by pricing up his belongings and sitting at the edge of our pitch -selling his wares! He has named this “Macs Mini Market” -which is very scary – because that’s exactly what his Dad did some years ago at school. Tonight- he actually came home with a profit! Yesterday he made 2 euros profit and today he has come home with 13.75 Euros, bought 4 ice-creams (for himself and Jemma) and his Dad a beer at the pool-side bar! It may be difficult to imagine – but time is flying by so fast here -the day is almost done before it starts....Phil is practising his Diablo skills (or lack of them!) until they are good one day! The children say they are very good until I start to watch – and then it all goes wrong?! We treated ourselves to a meal in the restaurant and have now seen how important it is to learn the local tongue! We ordered - what we thought was Steak and vegetables - only to be presented with a whole seafood platter! Fish filled the entire plate from octopus rings, tuna steaks, langoustines, shrimps, salmon and hake (to name but a few !!) We ploughed our way through this – Phil was in his element, although I ate the octopus rings just to get the off my plate! I have to say that they reminded me of chewing gum............ and Phil did his “Mr Bean on Holiday” impression with the shell fish – much to the children’s delight! Afterwards – when we were very full of fish – the kind waiter came and laid us some more cutlery. We were then given our steak and vegetable dish! This took quite some ploughing through and we did not need to eat for quite some time! Our neighbours at the table next door were laughing and I suggested to them that it might be a good idea if we learnt some more Spanish - at least we might know what we were ordering!! We have tried out a ‘new’ energetic game- called “Padel”. We have found out that this sport is very popular in Spain and Mexico and is just beginning to get known in England. We have not heard of it before but it is a fast paced combination of Tennis, Squash and Racquet-ball, with even a bit of Table-Tennis thrown in!! The game is played in a court about one third of the size of a tennis court with surrounding back and side walls – similar to that of a squash court. The ball is similar to a tennis- ball, however the racquets are solid paddles rather than string racquets. You must serve underarm with a bounce before the serve and you are allowed to play the ball off the walls too! This was great fun! · We drove past hundreds of acres of Salt Lakes on our approach to La Marina – many shallow flat lakes with mountains of salt nearby! · Real Life Flamingos at the road side –in the salt lakes on the approach to La Marina! We would like to point out that we are thoroughly enjoying our time in Europe, throughout every country, and that the writing in our blogs is purely made up of our experiences in those countries at that time – they are never intended to offend anybody.